A £1m modern home being built next to a historic mill made famous by author Thomas Hardy has been attacked as a "blot" on the landscape. Two artists and a councillor have objected to the glass and aluminium building being constructed next to Sturminster Newton Mill in Dorset. North Dorset District Council said people were given plenty of time to object before the building work began. 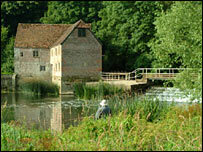 Hardy wrote a novel and poems while he lived near the mill at the River Stour. David Fox, a town and county councillor whose grandfather was born on the site in 1891, said the historic area has inspired writers and artists alike. He said: "You wouldn't put a skyscraper at Salisbury Cathedral. "It's so out of keeping and inappropriate." Hardy spent the first two years of his marriage to Emma Gifford, from 1876 to 1878, in Riverside Villa, which overlooks the mill and described it as "our happiest time". He wrote his novel Return of The Native and the poems Overlooking The River Stour, The Musical Box and On Sturminster Footbridge, during his time there. Developers Fulcrum Wessex said the single-storey flat roof house with pink-painted walls and orange-tiled roof that was there before was a blot on the landscape. Director Richard Wood said: "It was a very ugly structure and everybody wanted it knocked down. "The two artists that have objected need to go to Specsavers because what was there before was ugly. It has been there for 30 years." He said the modern four-bedroom house was being built from glass and aluminium and used "eco-friendly" solar power for its heating. Building work on the house, which was expected to sell for £1m, is expected to finish in February 2006. Mr Wood said: "The idea is not to have a loud, shouting, bright Hollywood house."